The festival will be held at Witton Park in Blackburn on Saturday 30th June from 10am – 3pm and will feature a range of free, family-friendly activities, including free bike and helmet hire, led rides and bike doctor surgeries. The new Weavers Wheel route has knitted together a number of existing paths and quiet roads to enable cyclists and walkers to explore the local landscape. Blackburn cyclists Kevin and Victoria Riddehough helped to map out the route after being inspired by the successful Preston Guild Wheel. The Weavers Wheel features a series of ‘spokes’ into the town centre and ‘spurs’ to neighbouring towns and has been designed to allow flexibility, using all or part of the Wheel to access local employment, education, retail and leisure opportunities. The Weavers Wheel is a great way to see the local countryside, exercise and travel around the borough in a carbon-neutral way. The route features artwork inspired by schools, community groups and organisations. A Weavers Wheel route booklet, detailing 18 different cycling routes for varying abilities, and a free ‘Blackburn Cycling Routes’ smartphone app are available to download from www.connectingeastlancashire.org.uk All the rides feature step by step directions, maps, an overview of what you can look forward to seeing on your journey, as well as places to stop off for refreshments. The Weavers Wheel has been funded through the Lancashire Enterprise Partnership’s Local Growth Deal and forms a key part of the East Lancashire Strategic Cycleway which also incorporates the new Valley of Stone cycleway in Rossendale, National Cycle Route 6 (Hyndburn and Rossendale) and the Huncoat Greenway. The idea for the Weavers Wheel came from local people, and the Council is proud to have helped make their vision possible. 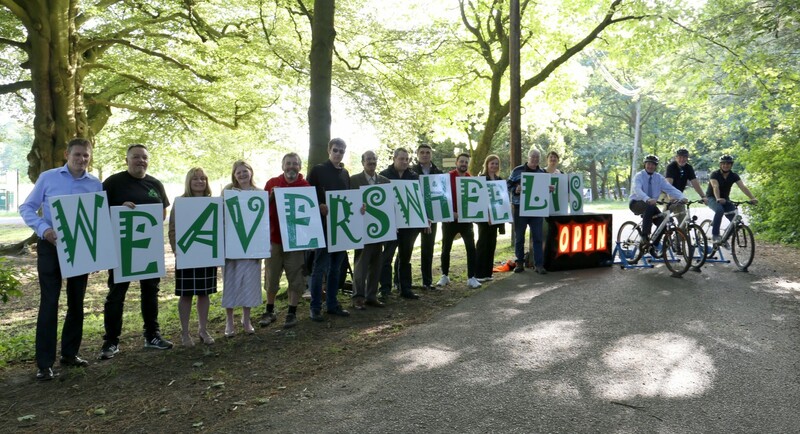 We were lucky to get funding from the Lancashire Enterprise Partnership to create the route which has been designed not just for leisure, but to provide an alternative way for people to travel to work, see friends, go shopping and much more. The Weavers Wheel gives people a fantastic opportunity to get out and about on their bikes or on foot and take in the local countryside and fresh air. Evidence has shown than an active lifestyle reduces the risk of diseases such as coronary heart disease, stroke, diabetes and some cancers, whilst also being beneficial to mental wellbeing. We’re immensely proud to witness the launch of what we believe will put Blackburn firmly on the cycle map for facilities available. We’ve always believed that this route will provide new or returning riders with an opportunity to enjoy some safe, signed cycling. This can only be good for health, wellbeing and cycling in general in the town. Our hope from here is that the Weavers Wheel will be well received and used by people from all walks of life. The Weavers Wheel isn’t just a weekend recreational facility, it passes numerous schools, businesses and retail sites with spokes and spurs taking you to where you need to go safely. We’re excited and feel there’s never been a better time to start cycling so come along to the launch, see what it’s all about and get out cycling. You may just enjoy yourself. Supported by £2.6m investment from the LEP’s Local Growth Deal Fund, the East Lancashire Cycleway Network is on course to deliver 120km of new and improved routes across the area. This means thousands more residents and visitors will be able to enjoy the benefits of cycling, an activity which has been proven to not only boost health and wellbeing but also increase productivity and drive economic growth.